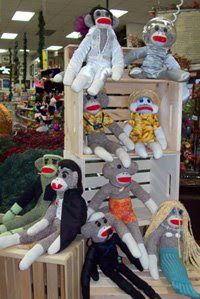 When you have an employee who is a "Sock Monkey " artist - why not throw a demo. Martin wowed all the customers last Saturday at our Monterey store with his creative style with the basic brown sock. 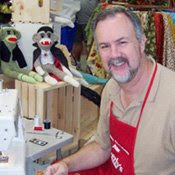 Kids of all ages stopped by the table to see how fast Martin can whip up a Elvis Monkey, Astronaut Monkey or even one who suspiciously looked a little like Indiana Jones. Beads and Baubles won the giveaway..... email us at info@beverlys.com with your address and we'll get that right out to you. Congrats! 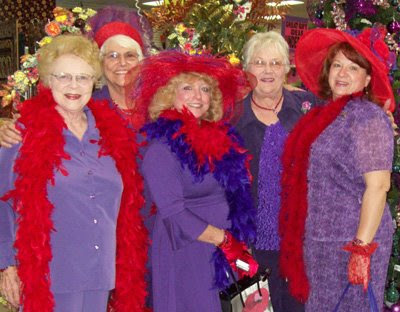 After a fun luncheon, part of Matilda's Red Hatters came by and visited the Monterey Beverlys. Could not resist a fun photo in front of our purple tree display. Patt, Mildred, Sissy, Rita and Deeane made our day.